It is with regret that we announce the passing of our friend and fellow Pacific Pin Club member, Dan Pederson, after a lengthy and courageous battle with pancreatic cancer. Dan was predeceased by his father Lawrence (Swede) Pederson. He is survived by his mother, Patricia Pederson, and many close friends. Dan was a long-time employee of the Abbotsford School District. He taught at Maple Grove Elementary School, Harry Sayers Elementary School and Eugene Reimer Middle School, where he was a positive influence and touched many young lives. He also volunteered many hours coaching and tutoring. Dan’s likes included sports, fitness, music and collecting “pins”. He could always be counted on to help out his friends and family. He particularly enjoyed family dinners. A memorial service will be held at the Trinity Memorial United Church at 33737 George Ferguson Way on Saturday, October 18th at 2:00 pm. In lieu of flowers, we invite and encourage all Pacific Pin Club members and pin trading friends of Dan to make a donation in his name to the Abbotsford SPCA, 34312 Industrial Way, Abbotsford, BC, V2S 7M6, Canada. 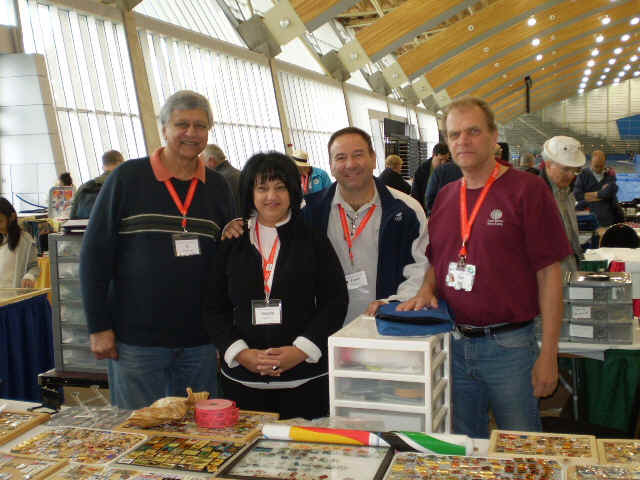 Pictured at the 2009 Olympin Collectors’ Club Show held at the Richmond Olympic Oval (L-R): Al Falco, Angela and Frank Zavarella and Dan Pederson. Dan and Frank were co-presidents of the Pacific Pin Club at the time.